Egg is our iguana. We got her as a younguana for Christmas of 1993. She's grown a lot since then. Now she weighs in at a good eating-size of 6 pounds. She spends most of her time dominating the apartment and the "stoopid humanz" that she allows to care for her (that would be us). Mostly she's good though. She is toilet-trained and not very destructive. We let her out of her house all the time. Egg is a vegetarian. Her diet consists mainly of collard greens, green beans, onion greens, carrot and zucchini with a topping of some kind of diced fruit, usually grapes or mango. She always fishes out and eats the fruit first. Usually she goes down and gets her own food, but sometimes she gets decadent and gets her food handed to her. Egg has had her share of traumas. She pulled a flowerpot down on herself and fractured one of her toes quite badly. She has also managed to break her tail. Her stumpy tail is still nice though and plenty long enough for her. During the day, Egg spends a lot of time sleeping on her basking branch. We made her a "snoutrest" which she seems to enjoy. I noticed her resting her snout on a rock once and figured she'd like a pillow. 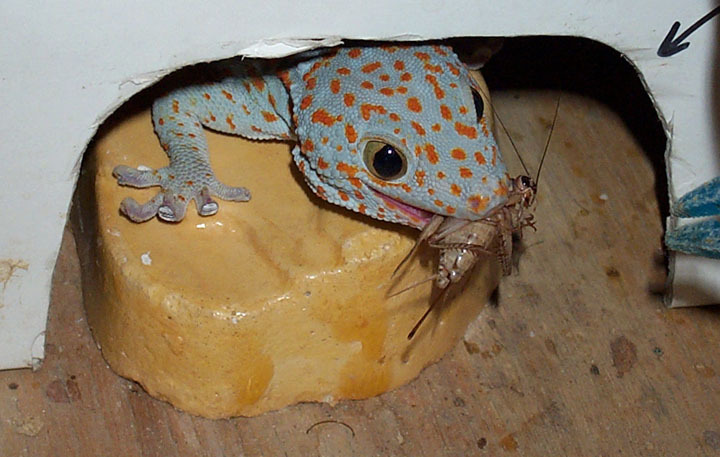 A rare tokay gecko action shot.